I know what you’re thinking. You’re thinking ‘did Greg Van Avermaet come second in Paris-Roubaix?’. No, he didn’t. He came third. John Degenkolb’s moustache won. A fine win it was too. “Degenkolb’s still there,” was perhaps the defining piece of commentary. The man who finished second last year was in the key group without really doing anything noteworthy throughout the race but then emerged when it really mattered. Young Belgian, Yves Lampaert, and Greg Van Avermaet had popped off ahead with just a few kilometres to go and our man went after them. Having reached them, they stopped working because Degenkolb is by reputation a far better sprinter than either of them. But despite all that work, all the cobbles and the other 200-and-odd kilometres, Degenkolb outsprinted them both and a whole bunch of other riders who’d caught up with them thanks to all the buggering about. That’s not a reference to Zdenek Stybar, who was able to ride with his teeth in today. Whether that’s what helped him finish second, I don’t know, but after winning Strade Bianche and another second-place in Gent-Wevelgem, he’s worth watching next spring. But what of the big man from this spring, Alexander Kristoff, the jet-powered truck? It was never true that he was unbeatable, because at Paris-Roubaix, everyone’s beatable – if nothing else, all it takes is a puncture, a crash, or the 3.40 to Lille passing a level crossing at the wrong moment. However, the truth is that he was probably just a bit tired. Form and fatigue tend to build alongside each other and after six victories in just over a week, including the Tour of Flanders, the latter may just have started having greater influence than the former. He still finished tenth. Kristoff and Degenkolb both have two Monument wins to their name now. To my mind, they’re leading the next generation of big names who will take over from Fabian Cancellara and Tom Boonen as spring greats. Geraint Thomas crashed out, as is his wont. Ian Stannard never really recovered top form after suffering a virus earlier in the spring. However, a notable ride was Luke Rowe’s. Before the race, Rowe was very much the fourth of Sky’s four Brits, but he turned out to be the most successful. I didn’t monitor what he was doing for the entire 200-and-odd kilometres, but there were definitely times where he was doing the grunt work for team-mates and yet he finished ahead of all of them in eighth place. Rowe seems to have newfound respect within the team and we can expect him, alongside Thomas and Stannard, to be one of Sky’s major players in the classics next year. It was never too likely that Wiggins would win a spring monument in the twilight of his road career, but all those who’ve paid attention solely because of his presence – keep watching. 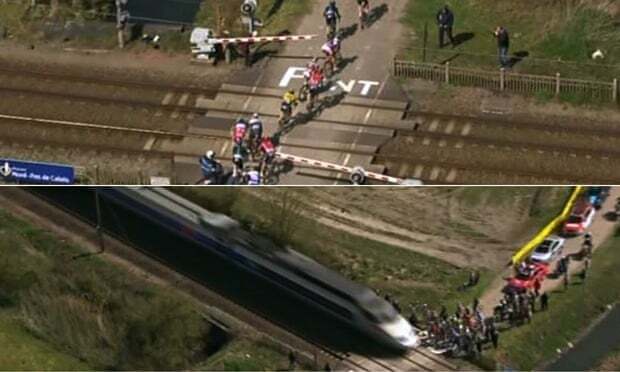 Paris-Roubaix is something of a dead-end in the season. Suddenly, all the big, burly Belgians have nothing to look forward to and have to shift their focus to doing donkey work on behalf of someone else in stage races. The spring one-day races continue, however, but the Ardennes Classics are different beasts altogether. Amstel Gold is the first, on Sunday. Philippe Gilbert won it last year (his third win in that race). La Fleche Wallonne follows on Wednesday and is particularly significant as the final, race-deciding climb, the Mur de Huy, will also be a stage finish in the first week of this year’s Tour de France. Alejandro Valverde won in 2014. Finally, the following Sunday brings Liege-Bastogne-Liege, won by Simon Gerrans in 2014, the hilliest of the classics and the one best-suited to stage racers and which therefore helps us segue into Grand Tour season. I know what you’re thinking. You’re thinking ‘did Greg Van Avermaet come second in the Tour of Flanders?’. No, he didn’t. He came third. 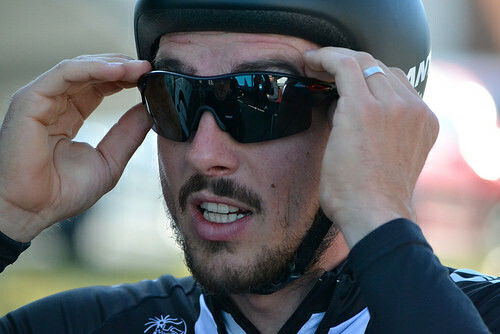 John Degenkolb’s moustache won. Running jokes work better if you remember to adapt them. Ta. Edited (even if it’s too late, for you can never recover a garbled joke).